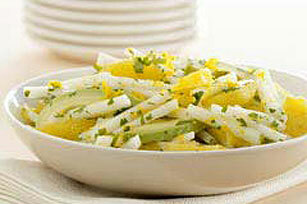 Take 15 minutes to make our Healthy Living Orange-Avocado Salad with Jicama Recipe. This Orange-Avocado Salad with Jicama Recipe is not to be missed. Peel and section 4 oranges; place in medium bowl. Add avocados and jicama; mix lightly. Grate zest, then squeeze juice from remaining orange. Discard all but 3 Tbsp. zest and 1/2 cup juice. Place reserved juice in small bowl. Add dressing; mix well. Add to salad; mix lightly. Sprinkle with cilantro and reserved zest. Choose a jicama that's heavy for its size and free of blemishes. Store in the refrigerator and peel just before serving. Use a sharp knife to peel a jicama, pulling the skin off in sheets. Prepare using KRAFT Italian Vinaigrette Dressing made with Extra Virgin Olive Oil.